Ethics in neurology are the basis of all practical work as well as for research activities. In a critical analysis of the used ethical principles, it has to be stated that the contemporary ethical laws are missing different religious, traditional and cultural requirements. The contemporary ethics are based on the philosophy of Socrates, Plato and Aristotle, with the incorporation of the Christian philosophy of Saint Augustinus and Thomas Aquinas and should be called Western Ethics. But Western Ethics must not be acceptable worldwide. The ARG Neuroethics decided to found a task force with the aim to harmonize the ethical principles in neurology including transcultural considerations. As members of the task force, representatives of the Buddhism and Hinduism, the Islamic and Mosaic religions and the different Christian communities are invited. As a continuous activity of the ARG Neuroethics, the organization of teaching courses and informative workshops has to be mentioned. The organizers of neurological congresses and symposia are asked to include special lectures and training courses in the program. The great lack of ethical knowledge in scientific reports about new treatment programs or research projects is shameful fact and has to be strictly changed. A continuing ethical education is necessary. The ARG Neuroethics is asking for more active cooperation and for helpful support to follow the education for a better knowledge in ethical thinking and moral responsibility. 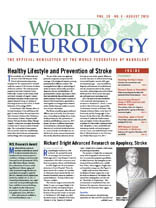 The aim for a worldwide acceptable basis for ethical principles in modern neurology needs great knowledge and an intensive preparatory work in philosophical, moral and ethical issues. Gerstenbrand is chairman of the Research Group on Neuroethics. He can be reached at f.gerstenbrand@aon.at.